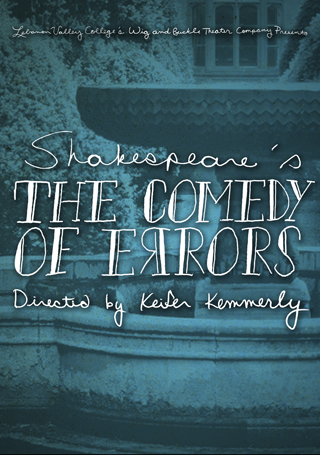 The Comedy of Errors is one of Shakespeare's earliest and shortest comedies. Often, people overlook this little show and see it as a prelude or trial run for later, larger and more 'serious' works, but to dismiss the show on these grounds is a mistake stemming from a hierarchy of genre where Drama is placed over Comedy. I'm not going to try to argue against this hierarchy right now, but merely ask you to respect the capability of the man we call Shakespeare to write the likes of Hamlet as well as a show like The Comedy of Errors, which is practically farce in its nature. The more I work with this script the funnier it is and therein can be found its success. 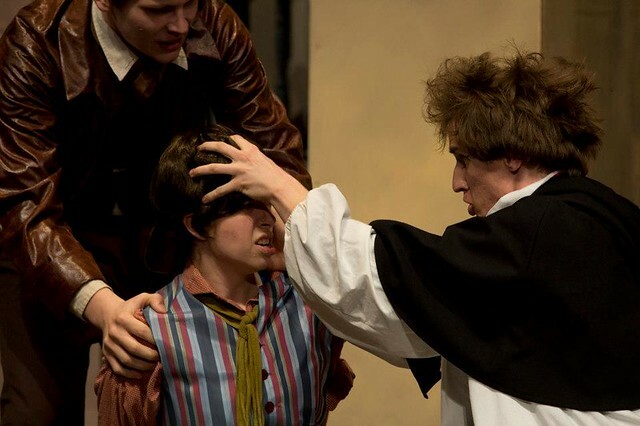 This isn't a good show because it has extremely deep and rife profound readings, though insightful things have been said of it, but because it's funny (even after 400 years) and for a show with Comedy in the title, I feel that should be enough. The show you are going to see is inspired, at least in plot, by Menaechmi,a play written by Plautus in the third century B.C. However, Shakespeare was not able to settle for one set of twins, like Plautus. The Comedy of Errors features two sets of twins: twin masters, the Antipholuses and their twin servants, the Dromios. When they are taken for each other, chaos and confusion ensues. It seems the only staple in this show is confusion. After all, the plot is driven by misunderstanding and miscommunication. But it is not just others who are perplexed by these encounters, but also the characters themselves. The Comedy of Errors takes a serious look at the question of identity and the confusion thereof. Constantly posing the question: what happens when our notions of self are questioned by others around us? For Antipholus of Syracuse, the foreign master, these errors capitalize on an already deficient sense of self. A state brought about by the loss of his brother with whom he was separated from in a shipwreck when he was nothing but a babe. Beyond the question of the identity, Shakespeare seems to play with the idea that identity is, at least in part, developed by our interactions with others. This is shown by the misidentification of Antipholus of Syracuse as well as Adriana's relationship with her husband, Antipholus of Ephesus. Who she thinks may be finding love in places beyond her home. The sour relationship is soothed by Adriana's sister, Luciana, but still Adriana argues that, "My decayed fair/A sunny look of his would soon repair" (Act 2, Scene 1). If only Antipholus would look on Adriana with pleasure she would not feel so beaten down. When I first found out I was going to be directing this show I had one immediate goal, namely, to keep the text intact and as unedited as possible. To this end I feel we have been successful. Too often people disregard Shakespeare's language as antiquated and out of date. I politely disagree with this notion. Shakespeare is a master of the language (an assertion which finds little opposition) and if you leave the script you leave what makes him and his shows exceptional. You would forsake his detail and imagery. For these reasons, I didn't want to use a modern text. Even though I did not want to use a modern text, initially I wanted to use a modern setting. However, to keep the servant/master relationship between the Antipholuses and Dromios intact I felt this would be inappropriate, though it has been done before. Instead, the show you see takes place in the late18th century on the edge of the Mediterranean Sea, somewhere around Valencia, Spain. To keep the text intact, the script was not altered to reflect this relocation. In conclusion, I would like to thank the cast, crew and you, our wonderful audience. Without each and every one of you this show would not be possible. Thank you and enjoy the show!